Counting money is often a difficult mathematical skill for elementary students. Use the word problems below to help your second grader master this skill. Solutions and explanations are provided for each word problem. In second grade, your child will be introduced to mathematical problems involving money. He or she will learn the value of each coin, how to count money and how to use monetary symbols appropriately. The word problems below will help your child improve his or her ability to count and calculate money. Students often benefit if they are able to visually solve math problems using a hands-on activity. 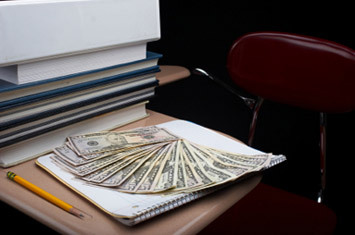 So, if your child is struggling, you may want to provide him or her with real or fake money. 1. Gabe had 15 cents until he spent three pennies. How much money does he have left? Your child first needs to know that three pennies equals three cents. To solve this problem, use subtraction: 15 - 3 = 12 cents. 2. Susan spent 68 cents on bubble gum. She paid for her gum with three quarters. How much change should Susan get back? Your child must first determine that Susan's three quarters equals 75 cents. Then, subtract the amount of money Susan gave (75 cents) by the amount she owes (68 cents): 75 - 68 = 7. Susan would receive seven cents in change. 3. At your lemonade stand, someone paid with $1.00. You owe them 26 cents in change. How many dimes and pennies would this be? We know that a dime equals ten cents and that a penny equals one cent. Two dimes would be 20 cents of the change and six pennies would be six cents of the change. So, you could pay using two dimes and six pennies. 4. You have 45 cents in your pocket. Your teacher is selling pencils for ten cents each. How many pencils can you buy with the money you have? Your child should add: 10 + 10 + 10 + 10 = 40. As a result, you could buy four pencils and have five cents left. 5. Two candy bars cost $1.40. How many quarters and dimes will you need to buy the candy? You will need four quarters and four dimes to make $1.40. This can be shown by adding four quarters (25 + 25 + 25 + 25 = $1.00) and four dimes (10 + 10 + 10 + 10 = $0.40). Your child would then need to add: $1.00 + 0.40 = $1.40.